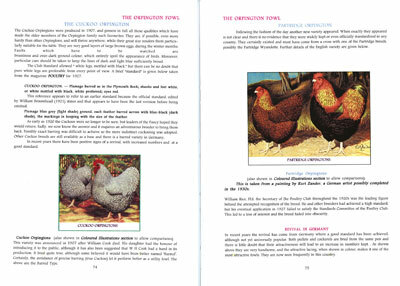 Sample page from the book showing some colour illustrations. The Orpington Fowl tells us how the breed characteristics have slowly been altered to meet the novelty of the time and the judge’s tastes. We learn how the different colours of Orpington came about, starting with the Black, White and the World famous Buff. Each of these three has a chapter devoted to them with the other Orpington colours being combined into another chapter. 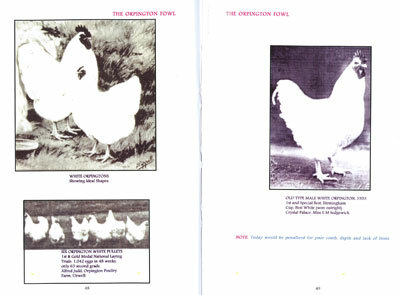 There are details on the Australorp that descended from the Original Black Orpington as well as a short chapter on the bantam versions of Orpington. If you are interested in showing the Orpington, then there are plenty of tips from the authors who have a considerable amount of expertise in this area. The final chapters cover breeding, feeding, incubation and rearing, and even include some of the more advanced techniques such as artificial insemination. There are several full page colour photographs included and many old photos and adverts from the poultry press of the time. Old photos are low quality but shape and type can still be seen clearly. It is worth noting that many photographs in this book are of fairly low quality. This is because most are very old and have been reproduced from magazines of the time where the original is no longer available. It is often the shape and type of the bird that is being explained and it would have been a great disappointment not to see these included. This second edition has been completely re-typeset and has seen some new illustrations as well as a few amendments.